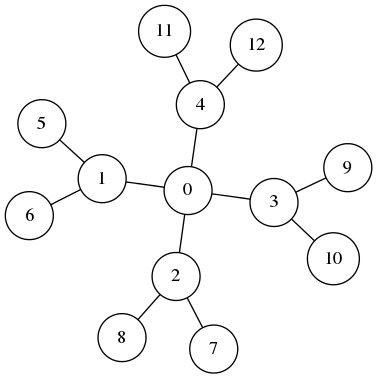 A breadth-first search (BFS) of a graph visits every neighbour of the current vertex before visiting the neighbours’ neighbours. This means that a breadth-first search extends radially from the starting vertex. Here is an implementation in C using a cirque for the queue. The function breadth_first_search() takes a graph in edge list form, the number of edges (size), the number of vertices (order), and a callback function that is called for each vertex visited. Here is an example program that constructs the graph shown at the top and then performs a BFS on it, printing the numbers of the vertices as they are visited.